Lamangirra Gumana lives and works in Gangan, a remote homeland in the Blue Mud Bay region of north-east Arnhem Land. 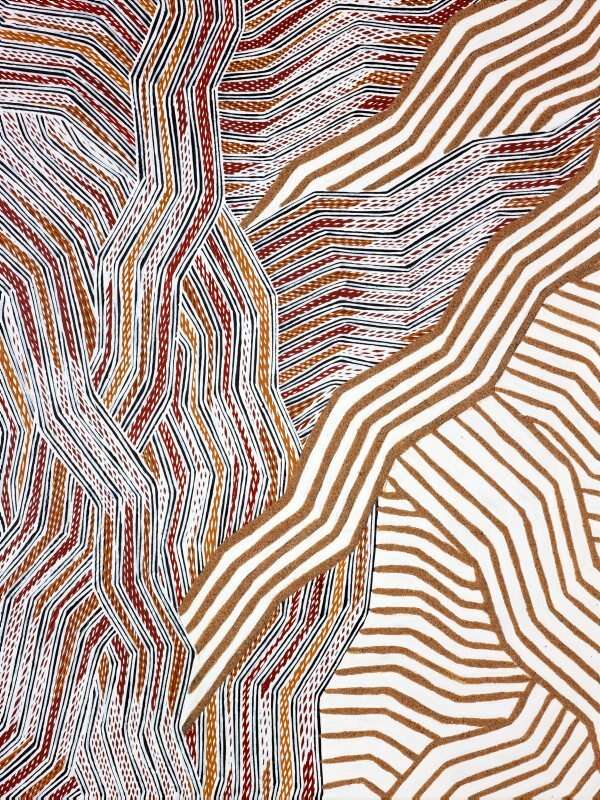 She has long assisted her husband, Gunybi Ganambarr, with his work. However she recently began working under her own name and is emerging as an innovative artist experimenting within the inherited designs of the Dhalwangu clan. 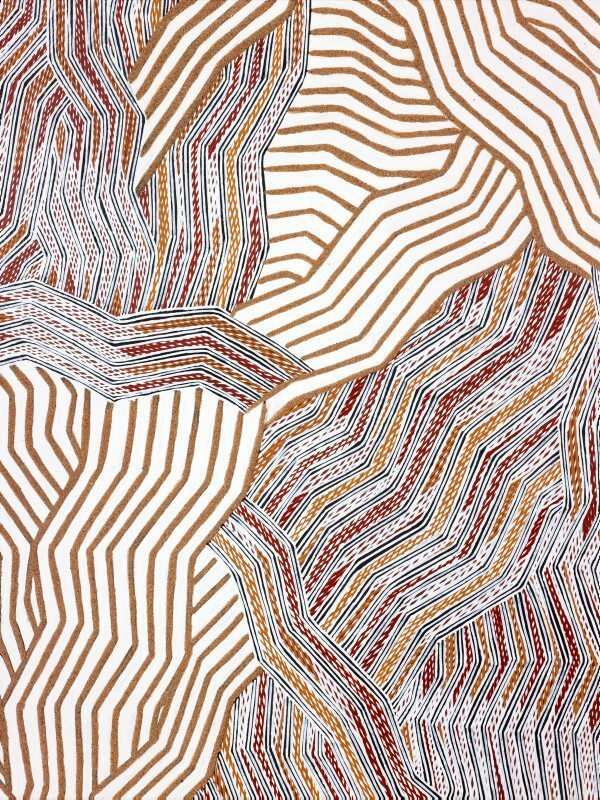 'Garraparra' 2015 depicts a coastal headland and bay area within Blue Mud Bay, and more specifially the Yirritja saltwater of the area called Mungurru. 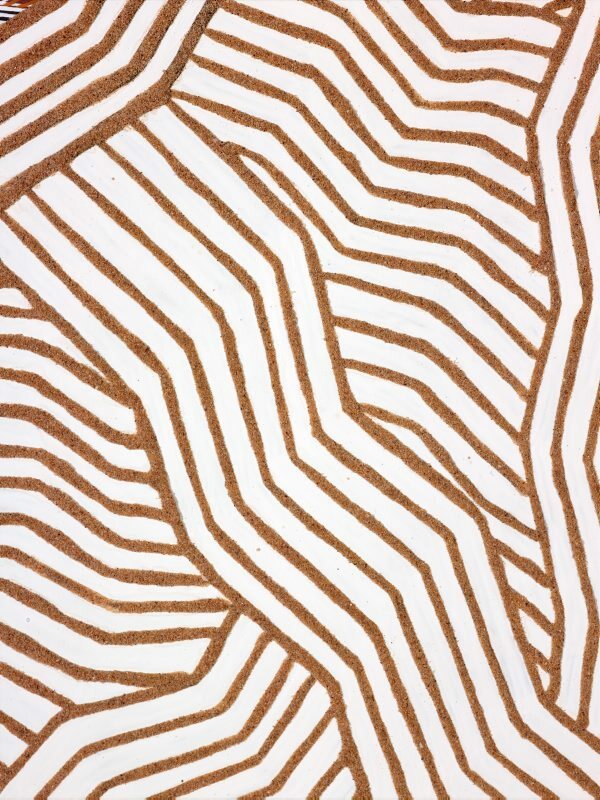 The wavy lines and overlapping fields of line-work represent the multidirectional waters of Djalma Bay created by the south-easterly gusts of the early dry season. Garraparra is a coastal headland and bay area within Blue Mud Bay. It marks the spot of a sacred burial area for the Dhalwangu clan and a site where dispute was formally settled by Makarrata (a trial of ordeal by spear which settled serious grievance and sealed the peace forever). and Gårun (turtle) are all referred to in the songs and landscape. Makarrata, the ritual throwing of spears at a miscreant of Yolgnu law took place here. At Garraparra sacred trees held these barbed spears whilst not in use. Garraparra has been rendered by the wavy design for Yirritja saltwater in Blue Mud Bay called Mungurru. The Mungurru is deep water that has many states and connects with the sacred waters coming from the land estates by currents and tidal action. Other clans of Blue Mud Bay that share similar mythology of the Yingapunjapu, i.e. the Madarrpa and Manggalili also paint the deeper saltwater - the Mungurru as such. This sacred design shows the water of Djalma Bay chopped up by the blustery south easterlies of the early dry season. From freshwater the waters migrate to Mungurru the mighty undifferentiated Yirritja saltwater ocean that plays at the horizon which receives and unifies all the Yirritja coastal saltwaters in one. It is from here that the water (soul) transmogrifies to vapour to enter the 'pregnant' Wangupini (Wet Season storm clouds) which carry the life giving freshwater back to the start of the cycle.